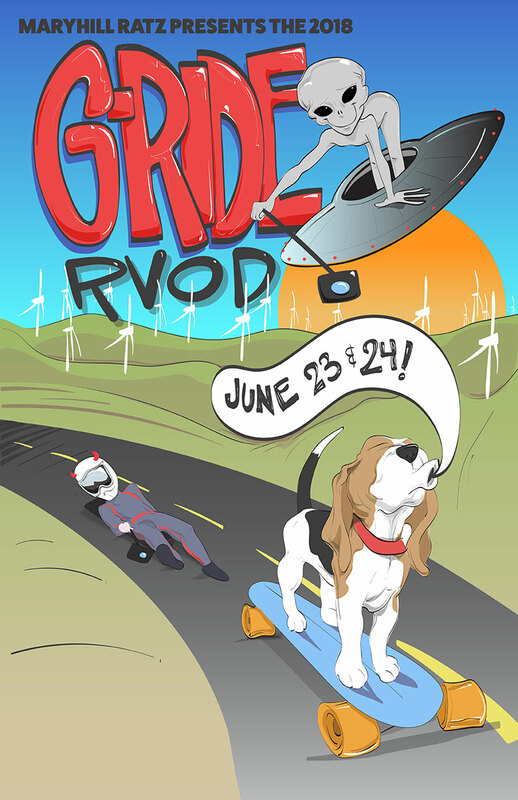 The “RVOD” G-Ride at the Historic Maryhill Loops Road, is a gathering of world class athletes for a weekend of racing, coaching, and, of course, skateboarding on the legendary Maryhill Loops Road. This event is open to all skill levels, from the never-ever to experienced racers. The small packs of skaters give the riders much needed experience and a shortened version of the road is available for those who wish to build their skills and confidence to tackle the whole hill. We also will have the SL,UT outlaw race on Saturday along with other fun activities including the Ratz scavanger hunt. In honor of Ryan Vanderveen, we want to bring awareness to depression and other mental health issues that someone you know, if not yourself, is suffering from. You are not alone and do not be afraid to seek help where ever you can. You may know someone, maybe someone very close, who took their own life this last year and we would like very much to prevent that from happening again. The Ratz and Skate School (http://skateboardsafety.com/index.php ) are teaming up to bring you the class of 2018 of the University of Maryhill. Headmaster Joe and his world class coaching staff will be returning on Friday afternoon June 22rd and continue throughout the weekend, with on-course coaching and difficulty options for all skill levels. Less experienced riders will have a chance to learn the skills they’ll need them to ride the Loops road from the top by the end of this 3 day camp. High speed safety skills make the difference between falling and crashing. Learn 3 ways to slow down and 4 ways to stop at speed, how to identify different types of turns, cornering techniques and the relationship between hand sliding and wheel sliding. By Sunday advanced riders will be learning start techniques, power pushing, the tactics of drafting, passing, cornering and advancing. Learn about how king pin angles, bushing and wheels sizes, shapes and duros can increase performance. Riders will also be given individualized ‘Homework’ to help them continue to improve and encouraged to set goals for racing. Skills Camp is an additional $85, plus local sales tax, to the G-Ride fee and you’ll get a University of Maryhill T-Shirt! The G-Ride entry fee is $140.00 USD. You can register at www.maryhillratz.com. Entry fee includes two days of safely riding the most famous skateboarding hill in the world, a personalized laminated badge and lanyard, a Maryhill Ratz water bottle and lunch each day. THERE ARE NO REFUNDS! 2nd PARTY SALES ARE NOT ALLOWED! Be sure you can go before you register.